What is the advantage of having multiple senses to sample the world? 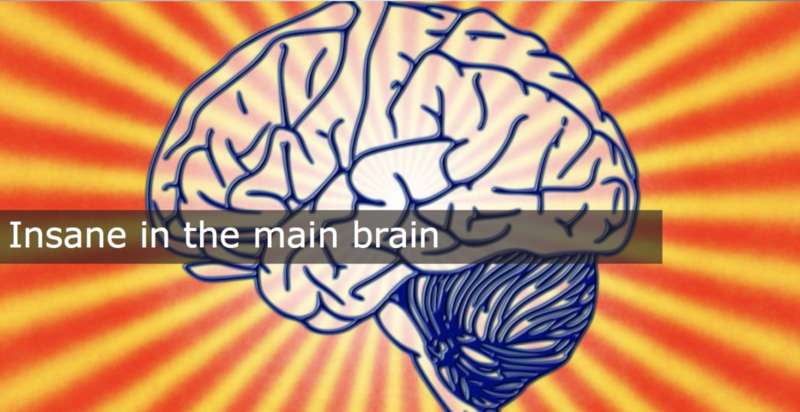 How does the brain integrate or segregate different sensory signals? What are the consequences of sensory deprivation for the mind and brain? Do blind people think differently about colors? What replaces voices or speech in deaf people? In the CPP-lab, we are trying to address these questions and many more. Olivier will talk about his research in the section Insane in the main brain, with the talk: Building a brain in the dark. The human brain evolved highly specialised regions dedicated to the refined processing of visual information. What does happen to these regions if you are born blind? Are they simply left dormant and unused? No! In case of blindness, the brain reorganises itself and the regions normally dedicated to vision now involved in the processing of information from the remaining senses. This demonstrates the fascinating ability of the brain to change the tuning of its neurons due to experience, a mechanism called brain plasticity. But what happens then if a blind person recovers sight? The ability to compute the location and direction of sounds is a crucial perceptual skill to efficiently interact with dynamic environments. How the human brain implements spatial hearing is however poorly understood. 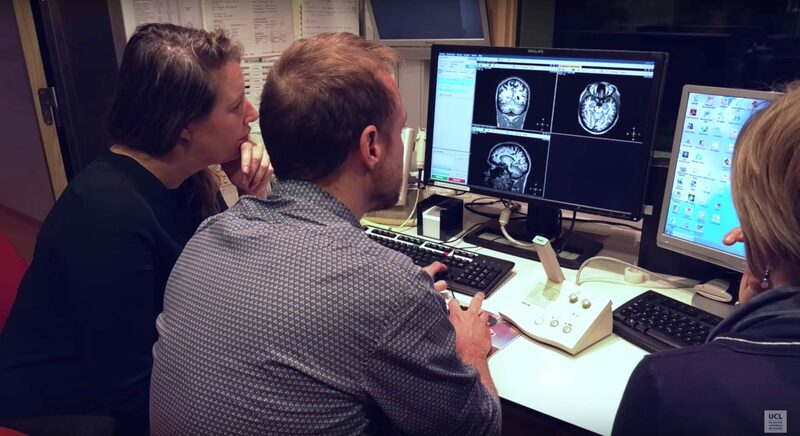 In our study, we used fMRI to characterize the brain activity of male and female humans listening to left, right, up and down moving as well as static sounds. 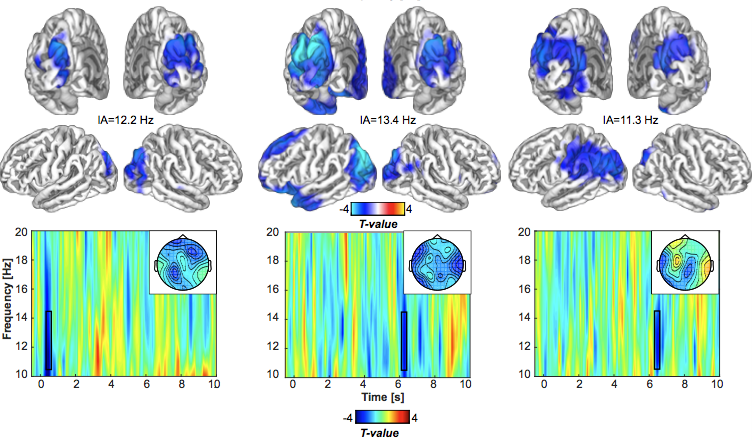 Whole brain univariate results contrasting moving and static sounds varying in their location revealed a robust functional preference for auditory motion in bilateral human Planum Temporale (hPT). Using independently localized hPT, we show that this region contains information about auditory motion directions and, to a lesser extent, sound source locations. Moreover, hPT showed an axis of motion organization reminiscent of the functional organization of the middle-temporal cortex (hMT+/V5) for vision. 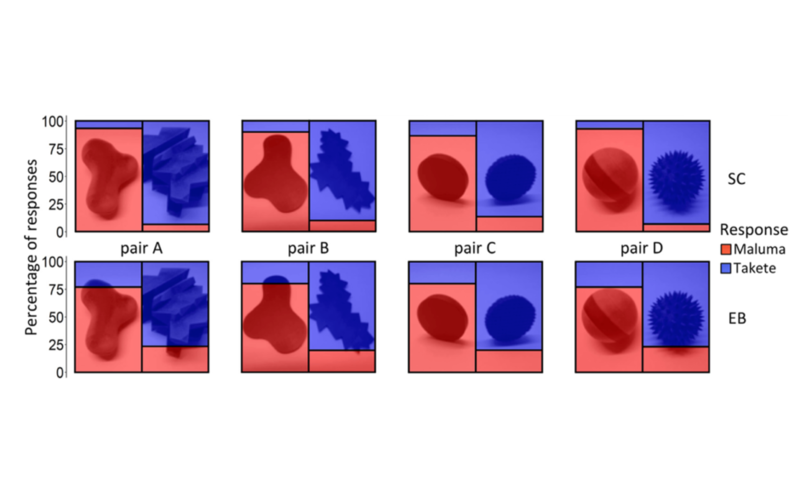 Importantly, whereas motion direction and location rely on partially shared pattern geometries in hPT, as demonstrated by successful cross-condition decoding, the responses elicited by static and moving sounds were however significantly distinct. Altogether our results demonstrate that the hPT codes for auditory motion and location but that the underlying neural computation linked to motion processing is more reliable and partially distinct from the one supporting sound source location. New paper published in Cognition. Non-arbitrary sound-shape correspondences (SSC), such as the “bouba-kiki” effect, have been consistently ob- served across languages and together with other sound-symbolic phenomena challenge the classic linguistic dictum of the arbitrariness of the sign. Yet, it is unclear what makes a sound “round” or “spiky” to the human mind. Here we tested the hypothesis that visual experience is necessary for the emergence of SSC, supported by empirical evidence showing reduced SSC in visually impaired people. Results of two experiments comparing early blind and sighted individuals showed that SSC emerged strongly in both groups. Experiment 2, however, showed a partially different pattern of SSC in sighted and blind, that was mostly explained by a different effect of orthographic letter shape: The shape of written letters (spontaneously activated by spoken words) influenced SSC in the sighted, but not in the blind, who are exposed to an orthography (Braille) in which letters do not have spiky or round outlines. In sum, early blindness does not prevent the emergence of SSC, and differences between sighted and visually impaired people may be due the indirect influence (or lack thereof) of orthographic letter shape. New paper published in Neuroimage. Arithmetic reasoning activates the occipital cortex of congenitally blind people (CB). This activation of visual areas may highlight the functional flexibility of occipital regions deprived of their dominant inputs or relate to the intrinsic computational role of specific occipital regions. We contrasted these competing hypotheses by characterising the brain activity of CB and sighted participants while performing subtraction, multiplication and a control letter task. 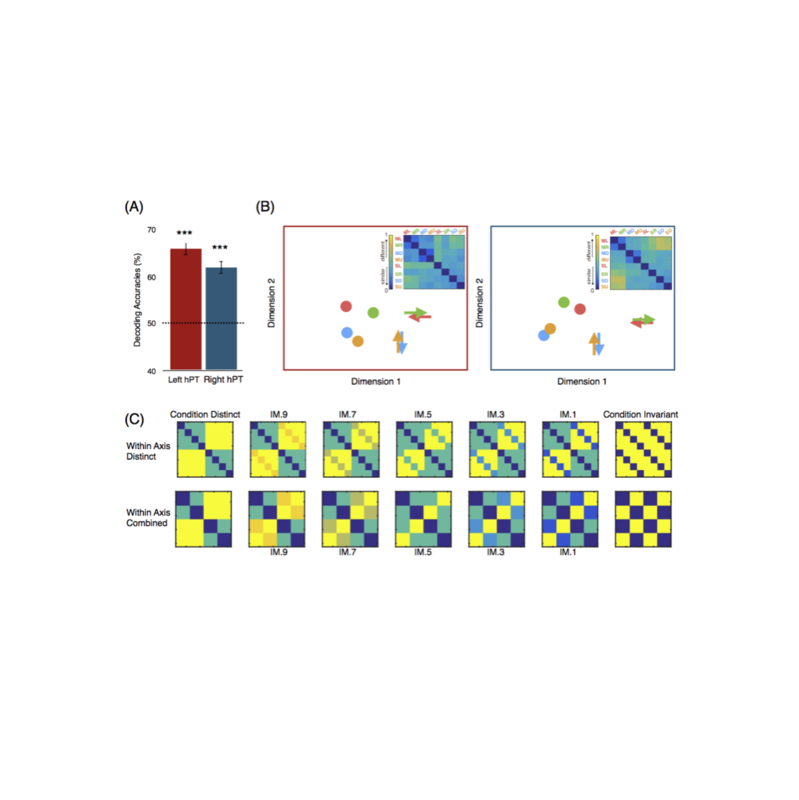 In both groups, subtraction selectively activated a bilateral dorsal network commonly activated during spatial processing. Multiplication triggered activity in temporal regions thought to participate in memory retrieval. No between-group difference was observed for the multiplication task whereas subtraction induced enhanced activity in the right dorsal occipital cortex of the blind individuals only. As this area overlaps with regions showing selective tuning to auditory spatial processing and exhibits increased functional connectivity with a dorsal “spatial” network, our results suggest that the recruitment of occipital regions during high-level cognition in the blind actually relates to the intrinsic computational role of the activated regions. Hierarchical brain network for face and voice integration of emotion expression. The brain has separate specialized computational units to process faces and voices located in occipital and temporal cortices. However, humans seamlessly integrate signals from the faces and voices of others for optimal social interaction. How are emotional expressions, when delivered by different sensory modalities (faces and voices), integrated in the brain? 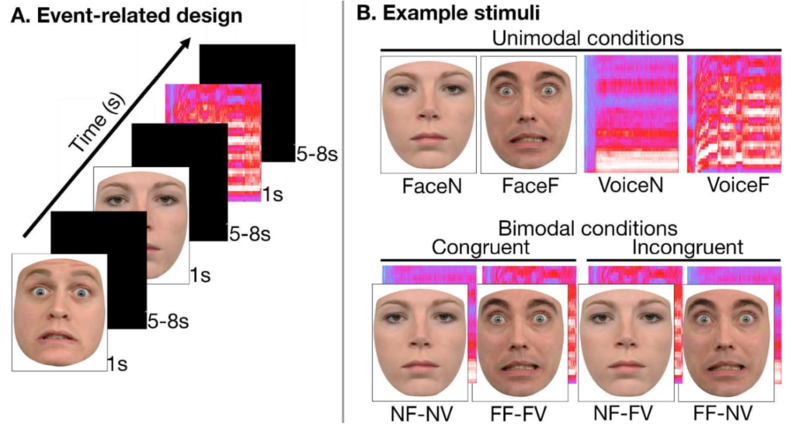 In this study, we characterized the brains’ response to faces, voices, and combined face-voice information (congruent, incongruent), which varied in expression (neutral, fearful). Using a whole-brain approach, we found that only the right posterior superior temporal sulcus (rpSTS) responded more to bimodal stimuli than to face or voice alone but only when the stimuli contained emotional expression. Face- and voice-selective regions of interest extracted from independent functional localizers, similarly revealed multisensory integration in the face-selective rpSTS only; further, this was the only face- selective region that also responded significantly to voices. Dynamic Causal Modeling revealed that the rpSTS receives unidirectional information from the face-selective fusiform face area (FFA), and voice-selective temporal voice area (TVA), with emotional expression affecting the connections strength. Our study promotes a hierarchical model of face and voice integration, with convergence in the rpSTS, and that such integration depends on the (emotional) salience of the stimuli. Recent studies proposed that the use of internal and external coordinate systems may be more flexible in congenitally blind when compared to sighted individuals. To investigate this hypothesis further, we asked congenitally blind and sighted people to perform, with the hands uncrossed and crossed over the body midline, a tactile TOJ and an auditory Simon task. Crucially, both tasks were carried out under task instructions either favoring the use of an internal (left vs. right hand) or an external (left vs. right hemispace) frame of reference. In the internal condition of the TOJ task, our results replicated previous findings (Röder et al., 2004) showing that hand crossing only impaired sighted participants’ performance, suggesting that blind people did not activate by default a (conflicting) external frame of reference. However, under external instructions, a decrease of performance was observed in both groups, suggesting that even blind people activated an external coordinate system in this condition. In the Simon task, and in contrast with a previous study (Roder et al., 2007), both groups responded more efficiently when the sound was presented from the same side of the response (‘‘Simon effect’’) independently of the hands position. This was true under the internal and external conditions, therefore suggesting that blind and sighted by default activated an external coordinate system in this task. All together, these data comprehensively demonstrate how visual experience shapes the default weight attributed to internal and external coordinate systems for action and perception depending on task demand. The discovery of intrinsically photosensitive retinal ganglion cells (ipRGCs) marked a major shift in our understanding of how light information is processed by the mammalian brain. These ipRGCs influence multiple functions not directly related to image formation such as circadian resetting and entrainment, pupil constriction, enhancement of alertness, as well as the modulation of cognition. More recently, it was demonstrated that ipRGCs may also contribute to basic visual functions. The impact of ipRGCs on visual function, independently of image forming photoreceptors, remains difficult to isolate, however, particularly in humans. We previously showed that exposure to intense monochromatic blue light (465 nm) induced non-conscious light perception in a forced choice task in three rare totally visually blind individuals without detectable rod and cone function, but who retained non-image-forming responses to light, very likely via ipRGCs. The neural foundation of such light perception in the absence of conscious vision is unknown, however. In this study, we characterized the brain activity of these three participants using electroencephalography (EEG), and demonstrate that unconsciously perceived light triggers an early and reliable transient desynchronization (i.e. decreased power) of the alpha EEG rhythm (8-14 Hz) over the occipital cortex. These results provide compelling insight into how ipRGC may contribute to transient changes in ongoing brain activity. They suggest that occipital alpha rhythm synchrony, which is typically linked to the visual system, is modulated by ipRGCs photoreception; a process that may contribute to the non-conscious light perception in those blind individuals.